The chart below began in early 2002 a general feature comparison between the Outlaw Audio Model 950 pre/pro (and Model 770 7-channel amp) and some other surround processors on the market at the time. The chart started as a question raised in the Outlaw Forum, but it doesn't really achieve the lofty goals originally set forth there (while I was able to compare feature lists, it is very difficult to compare performance of the different units). Because there is more to the performance of a processor, amp, or receiver than simple numbers or bells and whistles, this chart cannot give the entire picture of what these units are capable of. This serves only to offer some insight into how the various competitors stack up as far as features and approximate cost are concerned. Lastly, I gathered this information from a variety of online sources, and there may be errors and omissions. Update, 4/10/2006: As part of an extensive content update in the home theater section of my site, I'm making updates to this chart and the DVD chart as well as adding an HD player chart (HD-DVD and Blu-ray). Along with updating the units included in the chart, I've added some features to the chart: HDMI switching, HDMI audio support, whether input names are editable, and what type of remote is provided. The universal remotes specifically listed in the chart are the UEI Catalyst48 and Home Theater Master's SL-9000 (often offered as an OEM remote with the LCD display removed for receivers and processors), MX-500, and MX-700. An "x" indicates a proprietary universal remote, and a "." indicates a remote that can only control the processor. There will be a few new entries appearing in the coming year or so, including some additional audio formats (DVD-A and SACD as well as DD+, DTS-HD, and TrueHD) and equalization. The new chart has a few gaps in it, since Anthem's AVM40 hasn't started shipping yet and Emotiva's LMC-1 only recently started shipping. 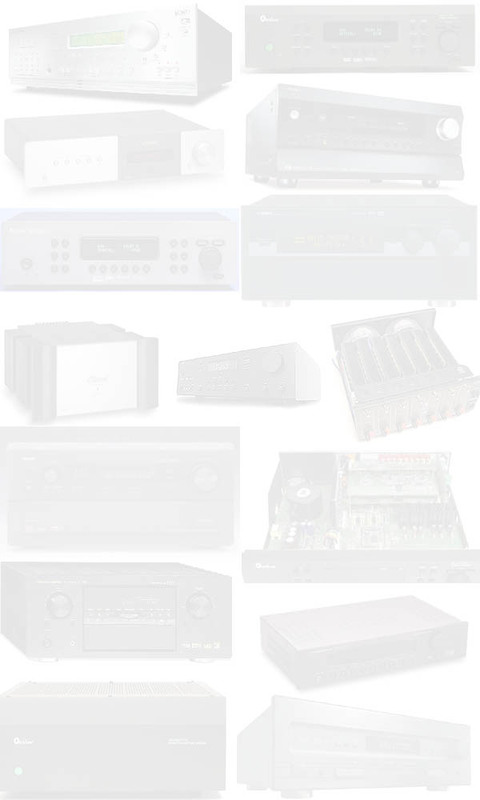 Tuner x x . x x x x 1 x x . . . x x . .
Phono x . . . . . x . . x . . x . . .
Headphones x x . x x x x . x x x x . . . .
LCD Monitor . . . . . . . . . . . x . . . . Balanced Audio In . . . 2 1 1 . . . . 1 1 . . . . Audio Outputs 2 1 1 . . . 1 1 1 1 2 2 2 1 . .
Transcode to Component x x x x x x x . x x . . x x . .
DVI Inputs 2 2 . . . . . . . . . . . . . .
DVI Outputs 1 1 . . . . . . . . . . . . . .
HDMI Inputs . . . . ? 4 2 . 2 5 . . . . . .
HDMI Outputs . . . . 1 1 1 . 1 1 . . . . . .
HDMI Audio Input . . . . x x x . . x . . . . . .
Transcode to HDMI . . . . ? x . . . . . . . . . .
7.1 Analog In 1 1 1 . . . 1 . 1 1 1 1 1 1 . .
USB x . . . . . . . . . . . . . . .
IEEE 1394 . . . x 8 . . x . . . . . x 8 . . .
Dolby Headphone x x . . . . x . . . . . . . . .
DTS 96/24 x x x x x x x . x ? x x . . . .
5.1/7.1 Stereo x x x x x x x x x . . . x . . .
HDCD . . x . . . . . . . . . . . . .
1 Unit includes both standard AM/FM tuner and NetTune Internet tuner. 2 The MC-8's analog audio inputs can be configured as eight stereo pairs, five stereo pairs and one 5.1 input, or two stereo pairs and two 5.1 analog inputs. 3 The MC-12's analog audio inputs can be configured as eight stereo pairs or five stereo pairs and one 5.1 input. 4 The MC-8 and MC-12 will transcode composite video to s-video, but will not convert s-video to composite. 5 One 5.1 analog input on the Adcom GTP-880 uses a DB25 connector rather than a set of six RCA inputs. 6 Digital inputs are permanently assigned to specific inputs, not user-assignable. 7 Lexicon MC-8 and MC-12 are available in unbalanced (MC-8, MC-12) and balanced (MC-8B, MC-12B) configurations. Prices shown here are for unbalanced; add approximately $1000 for balanced versions. 8 IEEE 1394 (FireWire or i.Link) is included on these units for future expansion, but does not currently support any input. 9 LMC-1's Pro Logic II/IIx modes alter the bass management configuration when used with Dolby Digital bitstreams (2.0, 5.1, etc.). Instead of the three adjustable crossovers, the LMC-1 employs a global crossover with the crossover point taken from the highest of the three user-defined crossovers. 10 "Analog Bypass" refers to the ability to allow any stereo analog input to bypass conversion to digital, allowing the signal to remain in the analog domain all the way through the processor.